Hexagonal tiles are also called Honeycomb Backsplash Tile in kitchen design, kitchen remodeling, bathroom design, bathroom remodeling and house flooring. Honeycomb backsplash tile is shortly named hex tiles in the market. Honeycomb backsplash tile counts as mosaic tile. Hexagons have been incorporated into homes for many centuries – you’ll even find them gracing the floors or Grecian temples and Roman bathhouses. In these days , this traditional pattern catches the designers eyes and is being trendy. Honeycomb backsplash tile works very well as a backsplash in the kitchen, particularly in neutral colors, so the contrast and interesting shapes jump out. In a bathroom, honeycomb tiles keep the room tightly waterproofed while adding more visual interest than a standard square or rectangle pattern. As a bonus set up and layout is pretty easy. Some stainless steel honeycomb tiles are ready to use , just like peel and stick backsplash style. In the kitchen design, the rules are still valid; small kitchen remodeling needs light color and large size of honeycomb tiles and large kitchen remodeling carries dark colors and small size of honeycomb backsplash.Lately, gray honeycomb is also very popular for gray kitchen cabinets. The most fashionable material for honeycomb backsplash is very old one: Marble honeycomb backsplash. 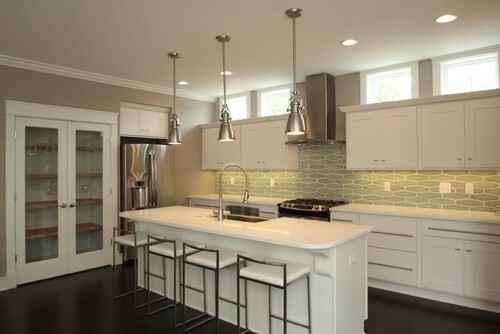 The kitchen design trend goes for white and gray colors and marble touches aesthetically. When the size of the marble gets smaller the price of backsplash tile increases. The second material is glass. 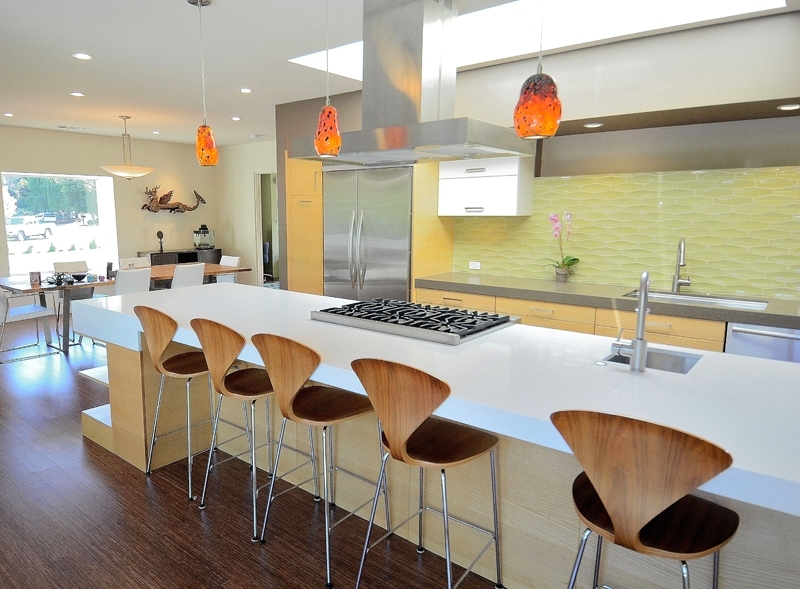 Glass honeycomb backsplash varies in colors and can be a good match for any kind of kitchen cabinets. Third place goes to cupper. Cupper glazed honeycomb backsplash brings shine and elegance to your kitchen. Another trend is Wall Murals in kitchen backsplash . 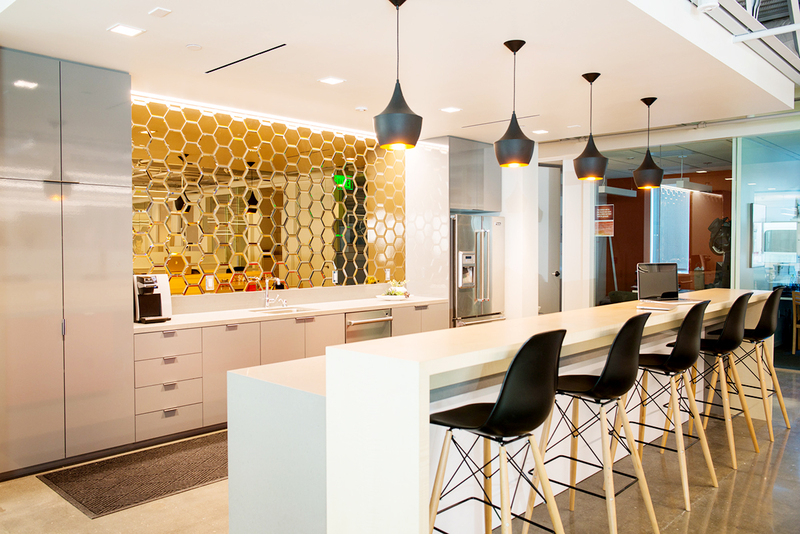 With a combination of geometry and food, the Honeycomb Texture Wallpaper Mural will be a perfect and versatile addition to your kitchen, if the wall has no backsplash before. 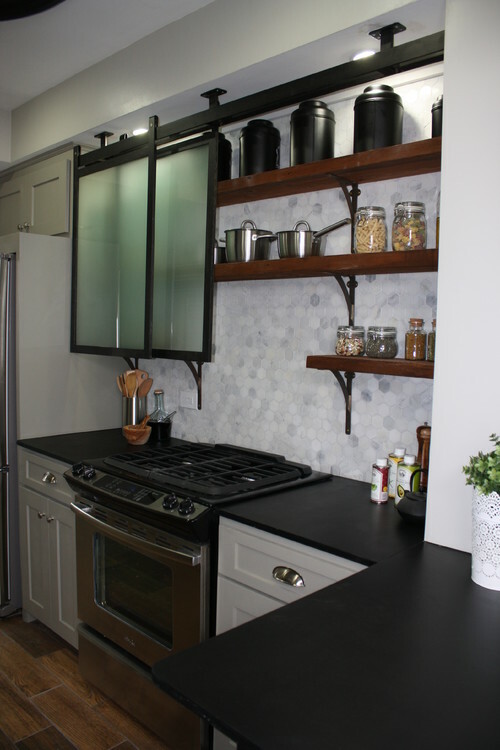 Ceramic and stainless steel are the other material options as I mentioned in my previous article brick backsplash tile . Usually designers pick standard hexagon sizes. If we assume the hexagon as a circle, the diameter predicts the size of the tile. From 1 inch to 5 inches diameters gives good results hex wall tiles in kitchen design. In addition, Elongated hex tiles are also in my favorite list. In my articles, I would like tag specific part of the house to show the details of the design element. But this time I would like to use some bathroom and flooring pictures too. Hope you like them all. Picture Credit:Rich Mathers Construction Inc. Ceramic elongated tile. 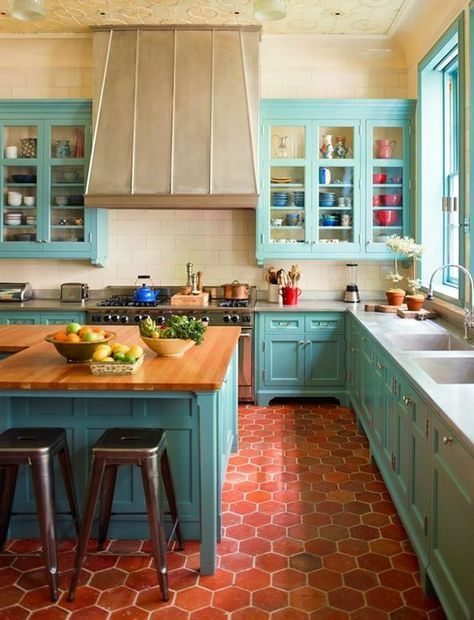 Picture Credit:Lochbuild via Houzz., Hex Wall Tile.